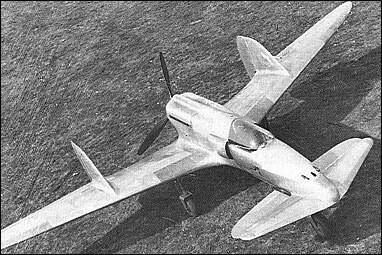 The single-seat S.S.4 monoplane fighter designed by Ing Sergio Stefanutti was tail-first configuration with a retractable nosewheel undercarriage. Built by the Societa Aeronautica Italiana Ing A Ambrosini it was of all-metal construction and powered by a 960hp liquid-cooled 12-cylinder Isotta-Fraschini Asso XI R.C.40 engine driving a three-bladed variable-pitch pusher propeller. With a 960-hp Isotta Fraschini Asso XI 12-cylinder liquid--cooled engine, the S.S.4 was capable of a maximum speed of 540 kph (335 mph) at 5000 m (16,400 ft) and was to have been armed with two 20-mm and one 30-mm can-non. The sole prototype was first flown on 7 March 1939, but was destroyed during its second flight on the following day when the starboard aileron separated, the wing developed a high amplitude oscillation and the aircraft entered a dive and crashed at Guidonia. Although. the Italian Air Ministry ordered another prototype, pressure of other projects caused the fighter to be abandoned. No further development was undertaken.